I have been looking for something in which to store and display my increasing collection of kusadamas, some of which are almost 12 inches (30 cms) in diameter. Clear boxes have one or more of several problems: they are too small, not the right shape, too weak or very expensive. First I sought out designs for cut out boxes. None of these were entirely appropriate, either. I began to think of making a rigid frame to which I could attach clear sheets of something. I wondered if the frame itself could be made out of some clear material. I am still wondering about that but do not have a clear answer yet. So far I have not come across anything clear that I would fold well. The closest thing is thin glassine which is not, of course, very strong. Velum cracks. Most plastic will not hold a crease. I consulted the origami literature on the web but discovered that frames which I might be able to utilize just did not fit the bill. Some of the better ones were difficult to put together, where designed to form balls rather than cubes or had too many visually distracting struts. In other words they were meant to be an art form or their own rather than a vehicle to show off something else. After weeks of frustration I decided to design my own display cases. I dislike working with huge sheets of material so I decided to make a modular frame which was strong enough to be made in a large size, be stacked up several high and be capable of having a floor inserted into it and acetate sheets glued to the struts or folded into them. I also wanted one which could be made into a cube or a rectangle and have struts where the thickness could be varied from model to model. In other words, I wanted a model which was fairly flexible in the way it could be made up and in the strength of the material which could be used to make it. After several attempts which did not come out quite right, including one in card weight material, I came up with the model shown here. The example is made from thin (20lb) copy paper in three colors. In spite of the flimsy paper the model is surprisingly strong. The example has strut reinforcers in the four uprights only and has a thin paper floor which is folded into the struts on two opposite sides. As my dedicated readers will know, I tend to use copy paper for all my prototype models as it is cheap enough to throw away in bulk as I discard one failure after another. Successful models are often made up with better paper but sometimes I post the designs here before I get around to that task - especially if the piece is a modular design which takes a long time to prepare, fold and put together. This one is a case in point. 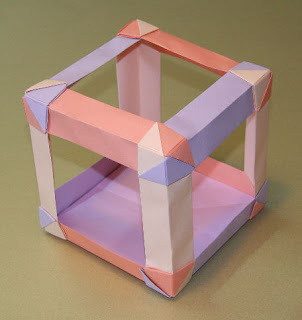 In any case, using three different colored papers helps demonstrate the way the model is put together. I intend to make the functional models in stronger metallic paper reinforced with relatively thick card in all twelve struts. The disadvantage will be that the last tab in each triad will be relatively more difficult to push in. The acetate sheet walls and floor will be glued on as acetate tends to crack if folded. I will experiment with other types of relatively inexpensive clear material of various rigidities. Velum may work. Overhead projection slides may work. I doubt, however, that something as thin as the stuff used for wrapping food will be of any practical use. Here are the crease patterns for the model. This time I have included thumbnail copies of the folding instructions. The full sized ones will be available in my book when it is published. You may not be able to read all the written comments but the diagrams and images are big enough to allow you to make the model anyway. Have fun.